How to use a base material to protect, seal dentin. 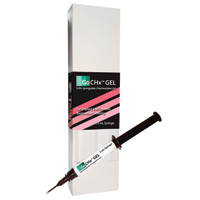 Ca-Lok™ is a light-cured, calcium-filled resin with adhesive properties to dentin and seamless compatibility to other restorative materials. Ca-Lok™ is radiopaque and releases fluoride. 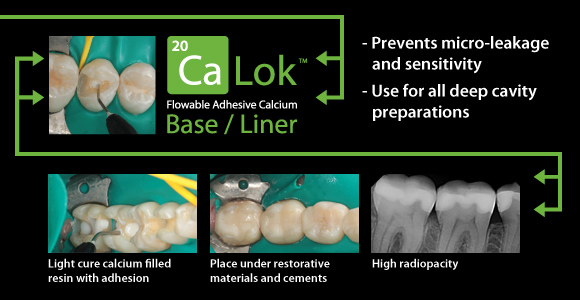 Ca-Lok™ is used as a protective liner with adhesion, which can be placed under restorative materials and cements for many types of cavity preparations. With its flowable viscosity and unique handling characteristics, precise placement and control is achieved. The remarkable hydrophilic/hydrophobic properties present during placement and light curing creates adhesion to tooth structure, resistance to microleakage and eliminates sensitivity. 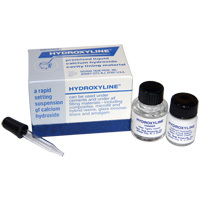 - Eliminates tackiness between instruments and filled composite resins. 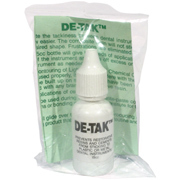 - A De-Tak™ coated instrument will not stick to the composite resin.